A homemade device for measuring cannon shell fragments. Ever find small cannon shell fragments and wonder what was the size of the full shell? 6-pounder, 12-pounder or 24-pounder? 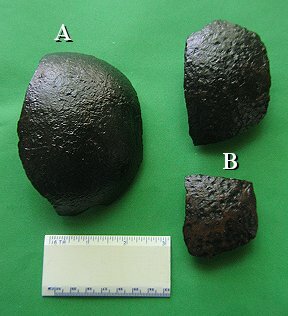 Cannon shell fragments like “A” in the picture to the left are easy to figure but what about fragments like “B”? Here is a simple measuring device that can be assembled from materials available from any hardware store and will provide the original shell sizes from “B” sized fragments. How it works….The Plunger measures the radius of curvature of the shell fragment by changing the height of its plunger’s rod. 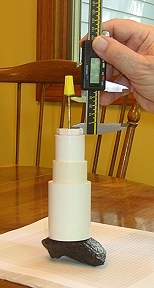 These height differences can be used to estimate the actual diameter of the whole cannon shell. 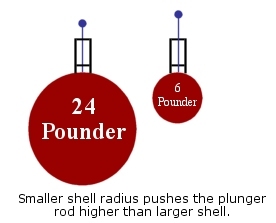 Larger diameter cannon shells (24 pounder) will move the plunger rod up very little while smaller shells (12 and 6 pounder) will move it up more. The rod height can be measured with a caliper or something as simple as a marked wooden pencil to estimate the size of the whole cannon shell from a small fragment of the original. Find the end of Part 2 which easily slides into Part 1; dry assemble these 2 parts together and set aside. Part 3 has 2 slip plugs with one at each end. Place Part 4 into Part 3 and glue these together with PVC cement. With a pen and ruler mark or scribe with lines the top of Part 4 connecting opposite corners of the plug. The common point of all the lines should lie at the center of the top of the plug. At that center point, drill a hole in the top of the plug beginning with a 1/16 inch drill bit and follow it with a 1/8 inch bit. The object here is to not “egg-out” the hole since this is where the measuring rod will travel. Mark the cap end as before to find the center of Part 5 and drill a 1/8 inch hole at the center of Plug 5. Next dry fit Part 5 into the other end of Part 3. It should not fit. Cut off the lower end of the plug so that it fits about ¼ inch INSIDE of Part 3. Glue Part 5 into the lower end of Part 3 with Duco-type plastic glue. Pass the brass or steel rod stock through the two holes in the plugs and center the rod stock. Let the Part 3 dry for about 24 hours with the rod in place. After assembled Part 3 is dry, Return to the dry assembled Parts 1 and 2, sand or grind the exposed inside end of the Part 2, till assembled Part 3 fits to the stop inside Part 2. Glue assembled Part 3 into Part 2 with PVC cement. Be sure to check to make sure rod lies at the center of the coupling assembly while glue is drying. Glue Parts 1 and assembled Part 2 together with PVC or Duco-type cement. Be sure to check to make sure rod lies at the center of the assembly as the glue drys. Cut the 1/8 inch brass or steel to a length of 7 inches and attach and glue optional washer and wire nut to one end of the rod. Assembly of the Plunger is now complete. MEASUREMENTS - Artillery tactical manuals of the Civil War (Gibbon, 1863 and Roberts, 1863) suggested that there was an optimal selection of ordinance to be used on advancing infantry and cavalry. At distances greater than 650 yards the hollow shrapnel shell (known as the “common shell’) or filled case shot projectiles were to be used on the enemy. Between 650 to 350 yards, solid shot should be shot directly at advancing columns or ricocheted into the columns. At 350 yards or less, canister should be used. Shrapnel shells and case shot were spherical and by use of a timing fuse were intended to stop or slow the advance of the enemy by “raining down” shell fragments on them. The table below shows the typical dimensions of these projectiles. The plunger measures a circular portion of a sphere (spherical cap) where the measured height of the plunger is equal to h in the diagram below and the radius of the PVC cylinder touching the surface of the shell fragment is equal to r.
Plunger measurements in the table below were calculated by plotting the radius of each of the projectiles around a common central point. The bottom width of Part 1 was measured to be 1.72 inches.. The height of the Plunger was measured with a caliper and recorded in the table below. The diameter of the projectile can then be estimated from the plunger height since the bottom width of Part 1 and its radius are both a constant. The radius of Part 1 value is ½ of its diameter (1.72 inches) or 0.86 inches. So if a shell fragment raises the Plunger rod about 4 mm then the fragment comes from a 12 Pounder shell. Four millimeters may not seem like much but you can use an electronic caliper to measure the rise of the rod. First, place the Plunger on a flat surface and “zero” the caliper between the top of the cap of the Plunger (Part 4) and the base of the washer glued beneath wire nut. Next, remeasure the distance of travel on a shell fragment with the “zeroed” caliper and it will directly read values similar to what is in the above table. A simple way to remember the Plunger distances in millimeters is sequence 3, 4, 5. Three-millimeter rise in the Plunger rod for 24 pounders, 4-millimeter rise for a 12 pounder and 5-millimeter rise for 6 pounders. Keeping track of “What fell where” is important if the relic hunter who is trying to determine the position of the artillery in an engagement and the Plunger will help do that job. Much of the above article was originally appeared in American Digger Magazine. Why isn’t an exact match? First, measurement of the fragment is subject to errors because of rust, casting thickness differences, and projectile casting voids. Second, Ordinance Manual values for projectile weight were made after casting and machining of the fuse-hole.